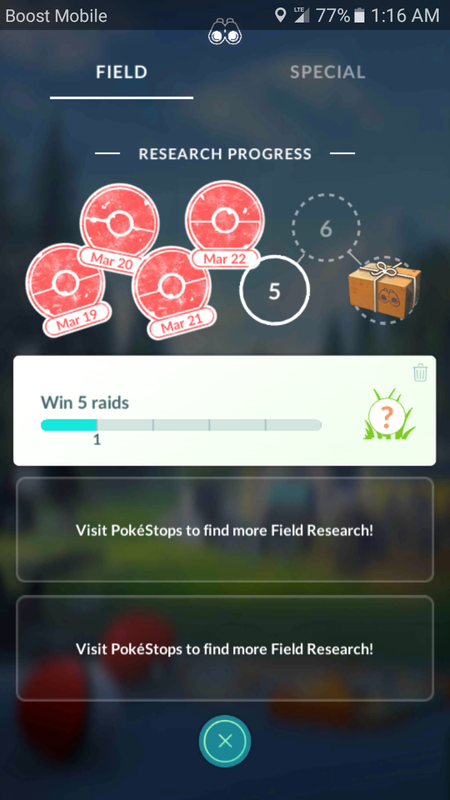 Nope, the Field Research tasks haven’t changed. Only now you have to make 5 Great Curveball Throws in a row to get a Spinda #2. I strongly hope that this task isn’t as uncommon as it was last two months. I got a Regice for my 7 day research this morning. Not even strong enough to compete in Great League PvP. Also, on a personal note, the RNG for this has been pretty bad for me. I have way more of each beast than I have seen of Bronzor, Cranidos, Shieldon, Glameow or Finneon in the wild. I know that Absol was hatchable a few days ago, not sure if it still is. Oh, my mistake! It was during Cresselia, right? Before that I think, it was released during… Mewtwo? It’s an Aerodactyl. I think you should trash the quest, as ‘Evolve a Pokémon using an Evolution Item’ is way more common and it gives an Aerodactyl, too. I didn’t know you could get Raikou from field research break through. I missed him when he came around for raid battles. He’s my favorite. Raikou is still one of the Legendaries I need a really good one with, and the best I have is a 91% with 13 Attack. I kind of hope Raikou will have a day like the birds do and I’ll hopefully snag a great one there. Raikou has been available for months.